MML in School Library Journal! 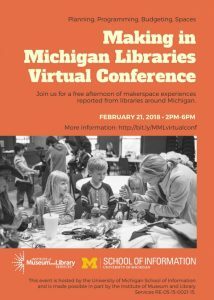 We were delighted that Making in Michigan Libraries was featured in this online School Library Journal story on SLJ’s upcoming online maker workshop series. The story will also run in January’s print issue. Kristin Fontichiaro adds that librarians should consider what’s best for their particular community. She’s a clinical associate professor at the University of Michigan School of Information and the faculty lead for the Making in Michigan Libraries project, which supports primarily rural areas. Good libraries have always been responsive to the needs of their community,” says Fontichiaro. “There’s a big need for folks to be learning with their hands as well as learning with their brains.” She says Making in Michigan Libraries doesn’t go in and tell librarians what to do or buy. Instead, they ask questions about what the community needs. “That helps us make purchases for things that get used as opposed to things that are showpieces,” says Fontichiaro. She stresses that every Maker space will be different. For example, some might need to be a place for students to wind down after a long day, while others might need to get students energized. “The biggest mistake we can make is to assume what works in one school or public library will work in every school or public library,” says Fontichiaro. The SLJ online Maker Workshop, which will include my discussion community needs, beginsJanuary 31. Those who register by Friday receive a 20% advance discount.